Breast Cancer has impacted so many people in our family and circle of friends that between a very dear friend, and I, we decided to produce a Breast Cancer Awareness book that would uniquely address the impact of this disease on those diagnosed as well as the impact on the people around them. This project occurred when Nancy's daughter was diagnosed with breast cancer, and when she informed her husband, he was extremely insensitive to her feelings and offered very little if any support. Ultimately they divorced, leaving her feeling uncertain of her own femininity and damaged self-confidence. The possibility of losing a breast and the impact of future relationships weighted heavily on her, and Nancy suffered as she saw her only child suffering. And to think, much of her feelings were because of misplaced priorities caused by the culture in which we live. When the idea of a book that would address the education, awareness, sensitivity and journeys of breast cancer patients was discussed, Nancy wanted to add a component to the book that would reflect the value of life and the inappropriate representation of breast as sexual objects that could destroy a woman's self-confidence and even relationships..
Nancy without hesitation wanted to be the first woman to pose "top-free" with her story about her daughter's journey. Even though Nancy did not have breast cancer, her statement by posing was to say, they are just another part of ones anatomy and the presence or absence of breasts do not make a woman. It was Nancy's feelings that unless this matter was addressed in this manner, many more women would suffer needlessly, and even though she held a very public positionas a manager with Hewlett Packard, she was willing and committed to the cause. Sadly Nancy passed away, but I am committed to completing this book in her memory. In so many instances women are terrified of how they will be perceived by others as well as loved ones. We have heard so many stories of women avoiding testing and exams because of the fear of information they might receive. So much is placed on breasts as a reflection of sexuality and womanhood. It was Nancy’s desire and mission, to increase the sensitivity of all to the challenges a woman endures, and the thought that her love, affection, personality and etc. which is what made her the loving person that is, can be lost because of misplaced associations of breasts as mandatory to being viewed as an attractive and loving woman. The thought that a woman could be so terrified of taking a life-saving action because of something so irrelevant to what she truly represents is an issue that this book is striving to correct. Many thanks to Nancy for her willingness to be so brave and committed to helping other women and men to realize that breast cancer does not change the person you fell in love with initially, and they need your support, understanding and assurance in their recovery and long term self-confidence. We are looking to produce a book that will provide input, assistance, encouragement and a level of sensitivity to others that may either be facing or know someone has been impacted by the challenges of Breast Cancer. 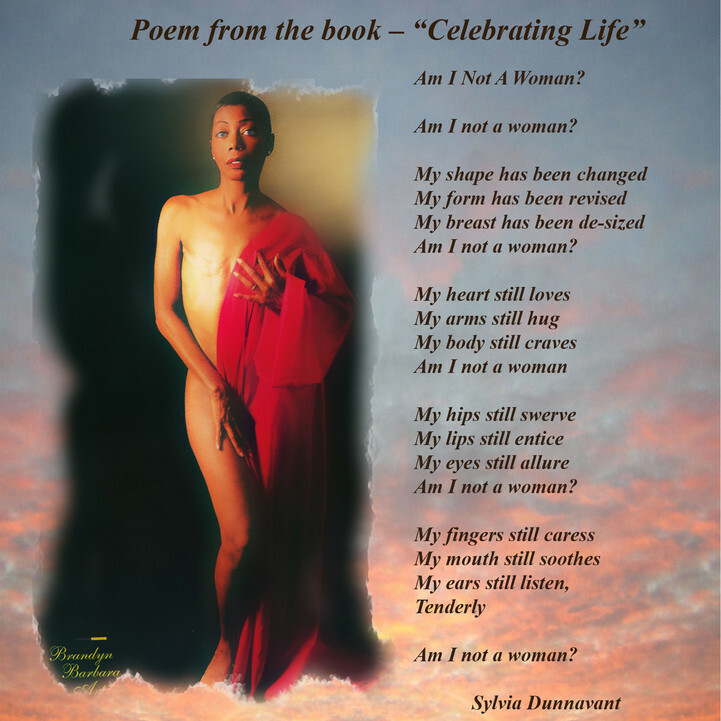 The book is an attempt to raise the awareness of breast cancer and to sensitize people of both genders. A breast cancer survivor faces many feelings and emotions that are hard to describe, but with people like you who are willing to share your experience in a unique and open manner, we are hoping to save lives, families and one's sanity. In our book, we will be featuring women “top-free” who either have been personally impacted by breast cancer or have had a close family member/ friend who were impacted. The “top-free” picture will be a statement that brings attention to the issue of the impact of Breast Cancer on their lives, in a manner that will remove the perceived sexual nature of breasts, raise the level of sensitivity for the person suffering from the disease and to educate all ages of both genders, of the damage that their comments and perceptions of breasts as sexual objects can have on the women in their lives that they claim to love. Opposite their picture will be their story reflecting their journey, which will assist others in understanding the emotions that one experiences in a way that will help them as they begin their own journey. I am hoping to have enough stories and featured women such that a variety of people will be able to relate to at least one of the messages. The book has received very good reviews from Breast Cancer organizations such as Living Beyond Breast Cancer, Self Magazine, Cure Magazine, doctors and etc. Portions of the proceeds from the book will be used to financially support local breast cancer support organizations as well as research foundations. For the women who are featured in the book, they will have the option of retaining the proceeds from the sale of the book through their friends and family members. If they desire, the proceeds can be directed to a breast cancer organization of their choice or, used to establish a trust fund for their children/ family.